We got over the demise of the dodo, the passenger pigeon and even the Chinese river dolphin, but will we ever get over the upcoming possible extinction of sharks? Conservative estimates reckon that between 30 to 70 million sharks are killed annually in commercial and recreational fisheries, and some conservation organisations put that figure closer to 100 million. Sharks are killed for a whole manner of reasons, their meat is used for food, fins for soup, cartilage in health supplements, livers for oil, skin for leather and teeth for curios, some are even killed for the sheer pleasure of it. And demand is increasing. As whitefish stocks have collapsed previously unprofitable shark fisheries have become commercially viable and shark meat more acceptable. Even in the most optimistic of scenarios this slaughter cannot be sustained. Sharks do not produce huge numbers of eggs like other fish, their young are either born live or in egg cases and the average brood is only about 12 pups. Sharks first appeared on earth some 400 million years ago, before land vertebrates and before many plants had colonised continents. 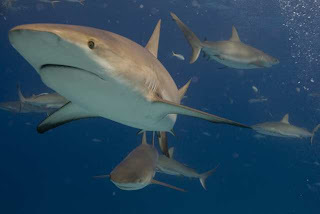 Modern sharks, such as the mako and the porbeagle, are regarded as living unchanged for 100 million years. The oldest great white shark teeth date from about 65 million years ago, around the time of the extinction of the dinosaurs. The fact that present-day sharks have not changed substantially for the last 100 million years suggests that they may have attained a level of evolutionary perfection that is unmatched by any other animal. And yet during the last 20 years alone humans have done more harm to sharks than had been done in the previous 100 million years, with some species of shark declining by 90%. It would be sadly ironic that having survived the extinction of the dinosaurs sharks may well disappear from this planet for the sake of shark-fin soup. Humans have been responsible for the extinction of a single species of animal in the past but never have a whole class been endangered as we see with sharks. In barely the time it has taken to set up and establish a cohesive shark conservation strategy we are in danger of losing one of the most iconic and evocative animals this planet has ever known. Shark fishing is mostly unregulated and conservation measures have been too slow in coming, but we can act now individually. If you see a Chinese restaurant selling shark fin soup, a health food shop selling shark supplements, a shop selling shark meat, or a media piece showing a 'sports' fisherman with his dead shark trophy, take five minutes of your time to tell them that this is totally unacceptable. An ocean would not be an ocean without sharks, and as an apex predator they are crucial to the marine ecosystem. Yet the current situation for sharks couldn't really be much worse I'm afraid. We are on the brink of watching the extinction of a whole class of animal that the world cannot afford to lose this time.